Select your product category below for pricing information. What will it cost for Shipping and do you ship to CANADA? EZ Snap® has two distribution warehouses, one in the the USA and one in B.C. Canada. Your order will be shipped by UPS for shipments within the U.S.A. and by Purolator Courier for all shipments within CANADA. 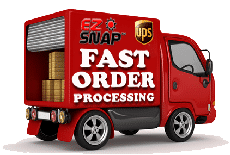 EZ Snap® makes sure you will never pay any Duties or Customs fees, as long as you are either in CANADA or the U.S.A.
All orders that are over $225 in value will be SHIPPED FOR FREE. You will be emailed a “Real-Time” tracking number, so that you can watch to progress of your shipment. Orders typically ship within 24 hours. All prices in US funds. Traveling time from the time your order ships is typically 4 to 7 business days to most points in North America. We also pay all Duties and Customs fees on every order. Real-Time Tracking sent to your email. UPS / FedEx within the U.S.A.